In a promotional clip for their November 3, 2018 episode, Saturday Night Live comedian, and Grande’s ex-fiancé, Pete Davidson made a joke about the two’s failed engagement. 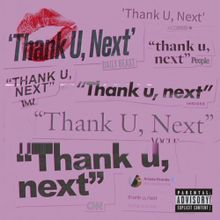 Once Grande was made aware of the clip, she expressed her disgust on Twitter, writing “for somebody who claims to hate relevancy u sure love clinging to it huh,” followed by simply “thank u, next.” The tweets were deleted shortly after. The next day, Ariana tweeted out a series of what appear to be lyrics, inspired by the event.